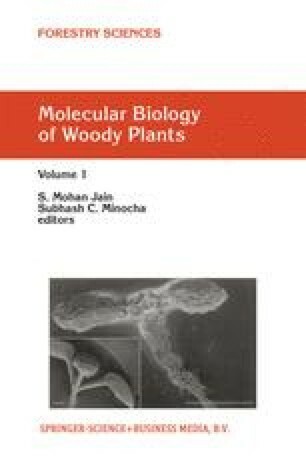 In woody species, the primary growth associated with shoot and root elongation is followed by secondary growth that increases the radial width of xylem and phloem through the activity of the vascular cambium. This meristem is similar to the shoot and root apical meristems in exhibiting highly controlled patterns of cell division, with individual derivative cells having specific developmental fates, but differs from the terminal meristems with respect to origin, position, histology and cytology (Steeves and Sussex 1989). Understanding the regulation of cambial cell division and derivative differentiation, i.e., cambial growth, is important because the tissues that are produced are essential for support and the long-distance transport of water and nutrients in perennial species. In addition, these tissues provide society with materials of major economic importance, e.g., lumber and paper, and, considering the current concern about increasing carbon dioxide levels, represent an important carbon sink.